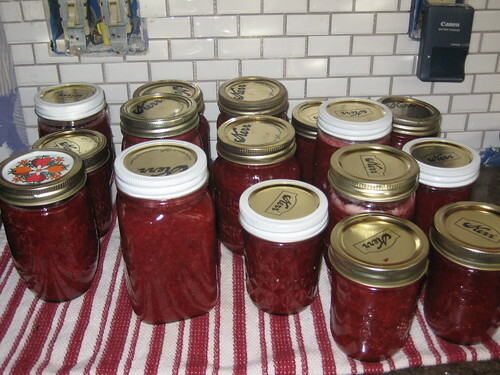 Day 3 of the canning is spent with my girlfriend and her Nonie – canning strawberries. My friend has a daughter that is Ryder’s age- so they played and Saige crawled around while we cooked 3 big stock pots of strawberries. These were some of the sweetest strawberries ever! I got 1/2 a flat from the Friday farmer’s market and the other 2 flats from the local strawberry farm (they aren’t certified organic- but they do not spray or use pesticides). I never buy conventionally grown berries of any kind because they are the ones that farms use the most pesticides with and it just goes directly into them- there is no protective skin (not that the skin keeps the chemicals from getting in). 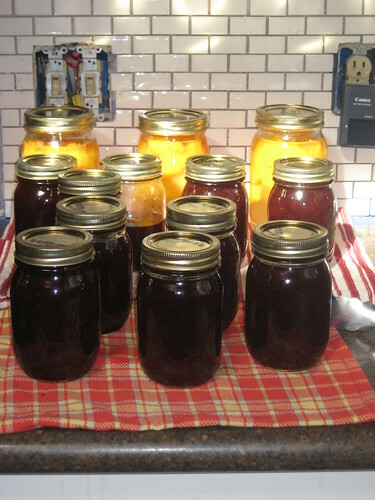 We had a lot of fun- canning is definately a process to be shared with others. It’s a lot of work- even when working together- but it’s more fun when there is someone to chat with. Unfortunately, the jam didn’t set right- so it’s more like a sauce. I am going to re-work this batch. I might save a couple jars as sauce- I actually have been using one of the jars on waffles and in my cream of wheat- which is super yummy. I think it would be great over pancakes and ice cream too. But I would really like jam too. So this weekend I will try re-working it to get a more firm consistency. So let’s see, I guess pears were day 4 so next is apple sauce for day 5. I am borrowing my friends peeler/corer- so hopefully I will get that this week so I can start this weekend. The gravenstein apples are ready! Phew, this is a lot of work- but I just keep reminding myself of the rewards. I do look forward to doing this when the kids are older and they can help. It will be good bonding time. Ryder was actually helping with the pears- he would drop them in the lemon water where they waited before jarring up. We only boiled over the strawberries 2 times- so I’m getting better! So, the madness began on Sunday- when I realized I could not wait to can the plums. I had a bag from a friend and about 1/2 had gone bad (they were sitting for a couple days). It just kills me to lose that much fruit – I just wasn’t up to the task during the week. And the plums I had just picked on Saturday morning were ready to go too- or I’d be losing those. 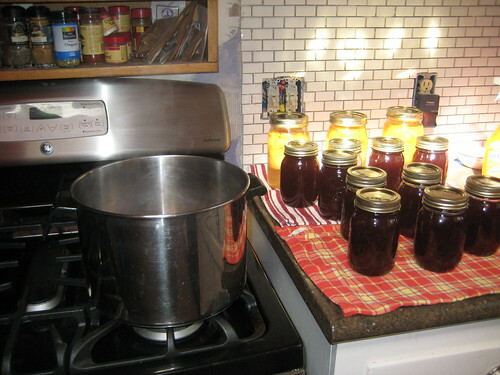 Now let me preface this by saying this was my first time canning – I had purchased a book (which is very informative and simple) but that was it. Everything I had read always talks about the fear of botulism– so of course I’m freaked out thinking “I don’t want to kill anyone with my food”. So I just follow the recipe and hope for the best. After multiple times of my pot boiling over I was ready to jar. Let’s just say the first two jars were a mess but after that I got the hang of it. Because of my paranoia and my inexperience I proceeded to the water bath (which you don’t really have to do with the jam because it was already smokin’ hot and would have sealed fine) but just to be extra safe. So I wash out the stock pot, fill it with water and add my jars. I proceed to boil for 20+ minutes but I still don’t hear the lids make that “pop” sound for the seal. So I pull them out and add a couple more and then I hear the “pop” as they are sitting on the counter. Well the light bulb goes off, I think they don’t seal until they are removed and start to cool. *please remember this is my first time. So I call my canning guru’s and ask them. Yep, that’s what’s happening and they only put it in for a couple minutes (basically to clean off the jars). So I’m feeling good and ready for day 2. Day 2 arrives and after I dropped Ryder off at school Saige and I picked up some more jars (smaller ones this time – I had some free ones that were big for the first round but wanted smaller ones moving forward – plus I need to save the big ones for the pears and peaches and apple sauce I’m going to be making). So we got home, threw the jars in the dishwasher to sterilize and begin to halve, core and peel the peaches. 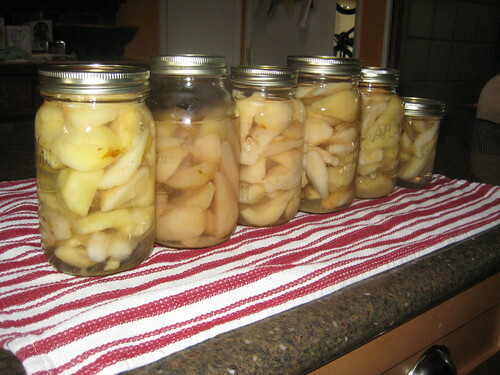 Pack those in the big jars (which I didn’t pack tight enough b/c they shrank up- oh well – mental note for the pears) make a simple syrup, pour it in and throw in the water bath. 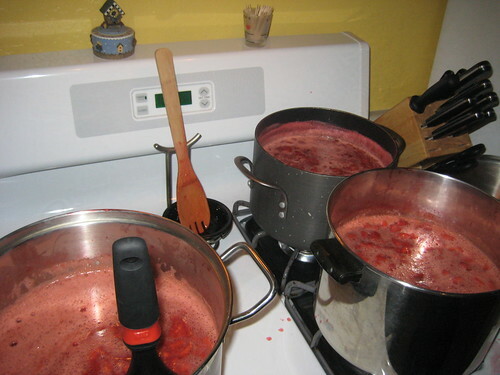 Next throw in the plums, boil, throw in the syrup and continue to cook. Now let me remind you, by the time we got home from the store it was after 10:00, needed to feed Saige and then started all this around 10:45 and I pick up Ryder at 1:00. Well, the time was quickly ticking away. Let’s see, I think I boiled this pot over about 3 times (and let me tell you that’s a lot of fun to clean up- thick, sticky, gooey mess). Now the jam is ready to be jarred but my jars are not done being sterilized in the dishwasher and it’s now 12:30. There’s no way they are going to be done in time for me to jar, drop in water bath and remove- and still be on time to pick up Ryder. So again I call my good friends for advise. Unfortunately they are not home. Oh well. We turn off the pot and leave to pick up Ryder. I promised Ryder a fun afternoon so after I picked him up we headed to the park. 3 hours later we were back at home and I had the pot back up to a boil. I figured I’d bring it back to a boil and back to 220 degrees and then jar (now that the jars were finally ready). I did have to skim out some sugar that had crystallized. Again the pot boils over. I jar it all up and start dinner. Day 2 has come to an end. My friends called me back and say that it’s ok to reboil like I did. 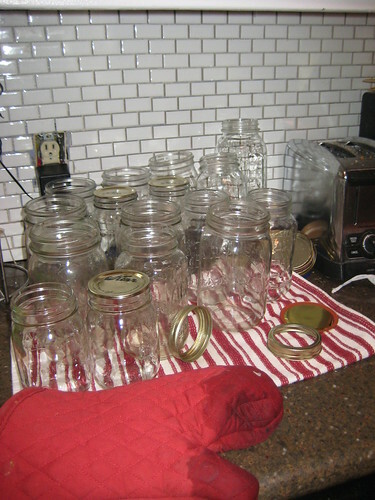 I thought all the jars had sealed but I realized the next morning that 3 didn’t so I’m tossing those- better to be safe. 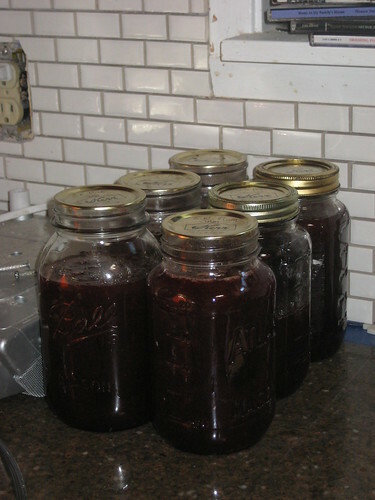 This second batch didn’t thicken as much as I would have liked- so we are going to call this plum conserve. I think I’ll attach a recipe card for bread pudding to the jars – that sounds good- bread pudding with plum conserve poured over it. Ready for round 3! Friday my girlfriend and I are going to do strawberry jam. Stay tuned, hopefully I’ve worked out the kinks and it’s always easier with someone else.